Potted Vine that attract hummingbirds. Who doesn't love looking out a window and seeing those amazing hummingbirds flying around your potted flowers? They are so small and colorful and they flap their wings so fast they make a humming sound. They fly right, left, up, down and backwards! Amazing creatures that everyone loves to see flying around their porch or patio setting. 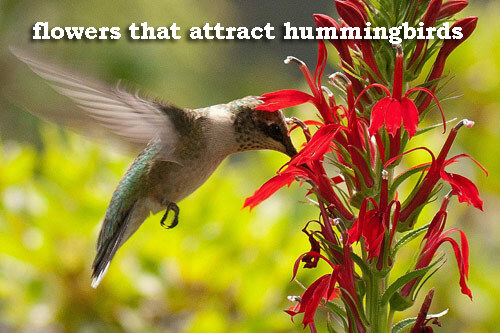 Well, here are a few tips on plants that attract hummingbirds. These plants and vines can be easily planted in garden containers and moved to where you can see them from indoor windows. Or place the garden pots around your patio table so that you can enjoy the hummingbirds while relaxing or eating outside. 1. 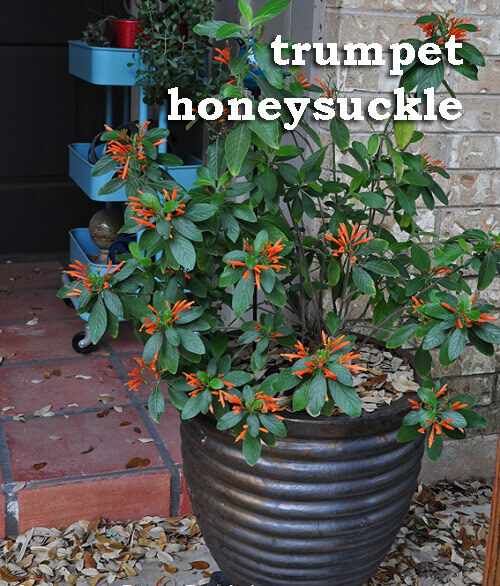 Trumpet Honeysuckle: Hummers, butterflies and bees all love honeysuckle. By keeping the potting soil moist and placing the garden container in full sun or even partial shade will you will the best flowering results. The bright red flowers will attract the butterflies and hummers. 2. 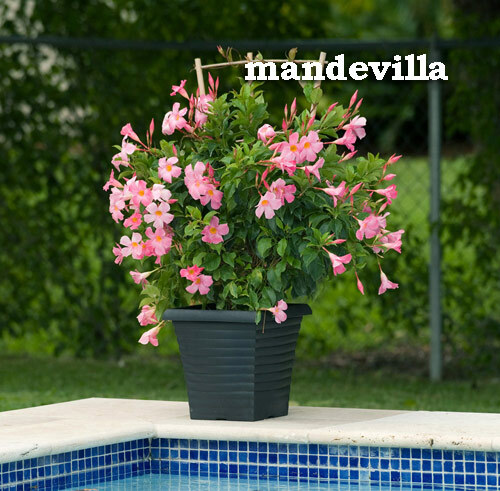 Mandevilla: Since this is a drought tolerant vine it's perfect for garden pottery but can also be used in a hanging basket. Put this container in full sun or partial shade with well drained soil. This vine can climb so place the pot next to a patio pillar or garden fence. 3. 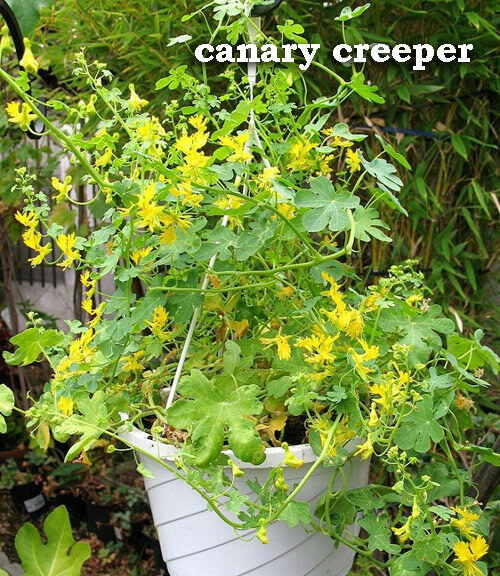 Canary Creeper: Another wonderful vine that likes full sun or partial shade with moist well draining potting soil. It can trail so you can put it in a hanging basket outside a kitchen window where you can watch the hummers eat. If you look at the flowers closely they look like canaries. Potted canaries, who knew! Wonderful. 4. 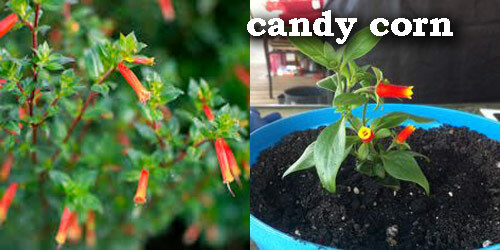 Candy Corn Plant: Love the look of these but you can't eat them. Only the hummers can dive bomb this flower. Again full sun and moist soil in your planters will work best. You can move this potted flower indoors during winter and make it a houseplant if you want. So here are few suggestions on what to pot up on your porch or patio and attract some hummingbirds. Give one or two a try and let us know how it works out! [Read More] Down in the dumps? Indoor Flowers Help. potted flowers for hummingbirds, potted hummingbird flowers, flowers to grow for hummingbirds.